Ask any other guide and they'll tell you the same thing I tell most people I work with - it's only pure chance and good luck that there aren't many more accidents out there at the cliffs. I find myself holding my breath and biting my nails while I watch potentially disastrous scenarios unfold on a near-weekly basis. This doesn't mean that many climbers aren't well trained or prepared, just that so many others are completely oblivious to the risks associated with their actions. As with other types of accidents, it's never one thing that causes a problem, but a number of small things that compound into something much worse. Risk management is the name of the game. As a guide, I spend tons of time working with clients interested in how to build good, solid anchors in a toprope environment. 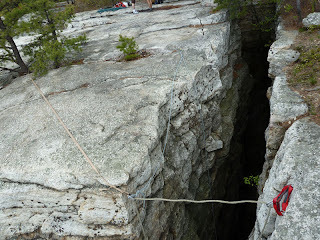 Busy weekends at Peterskill and the Mohonk Preserve frequently offer great "teachable moments" where we can discuss good anchor building techniques and practices. This was the case two weekends ago, while I was teaching toprope anchor building classes at Peterskill. On our way along the top of the cliff to our work site for the day we discussed some of the anchors we saw. Equalized - Anchor components (gear, trees, boulders, etc) should be equalized. Angles - Angles between anchor components should be low, less than 90 degrees, and ideally 10-45 degrees. Redundant - Is the anchor, beginning at the components, redundant all the way through to the climbing rope? No extension - If a component fails will the other components get shock loaded? 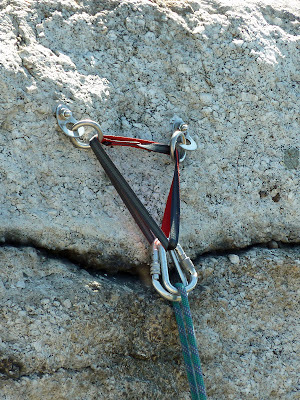 Secure - Anchor components should be unquestionably strong. Timely - Last and least importantly, the anchor shouldn't take all day to build. Climbing is the real objective, isn't it? Let's look at the good anchor first. This anchor uses 10mm static rope to equalize two solid bolts. The angles are low and the static rope extends over the edge to protect the climbing rope from undue wear. 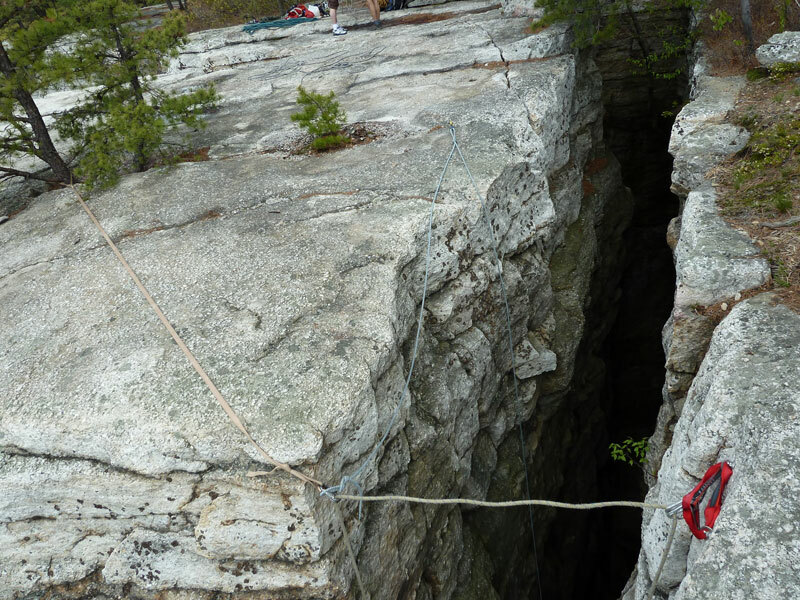 There is webbing (acting as a sheath) over the static rope, providing additional edge protection and a prusik hitch on the right side for the person to use as a tether while they're building the anchor (falling off the cliff could ruin your day). Out of sight over the edge there are two bight knots in the static rope where it meets two locking carabiners and the climbing rope. The static rope is attached to the bolts with a figure eight on a bight on one side and with a clove hitch on the other side. The clove hitch is adjustable making it easy to get good equalization. Behind the clove hitch is an overhand on a bight, just in case the clove slips or is tied improperly (slippage is highly improbable but it's still good to have this). Ahh. The American Death Traingle, a lazy person's anchor configuration. I can't remember the last time I saw one of these. It might have been 1999. Is this anchor awful? No, not really, but it's not good either. The american triangle places undue stress on the individual anchor components by multiplying forces. It pulls the anchors together and down. At 45 degrees nearly 100% of the load is placed on each bolt. The bolts are strong, new, close together and have stainless rappel rings on them. So, the anchor components are good. However, This anchor lacks redundancy because there is only one sling. If this sling fails it's a game-ender. Is redundancy required all the time? No. 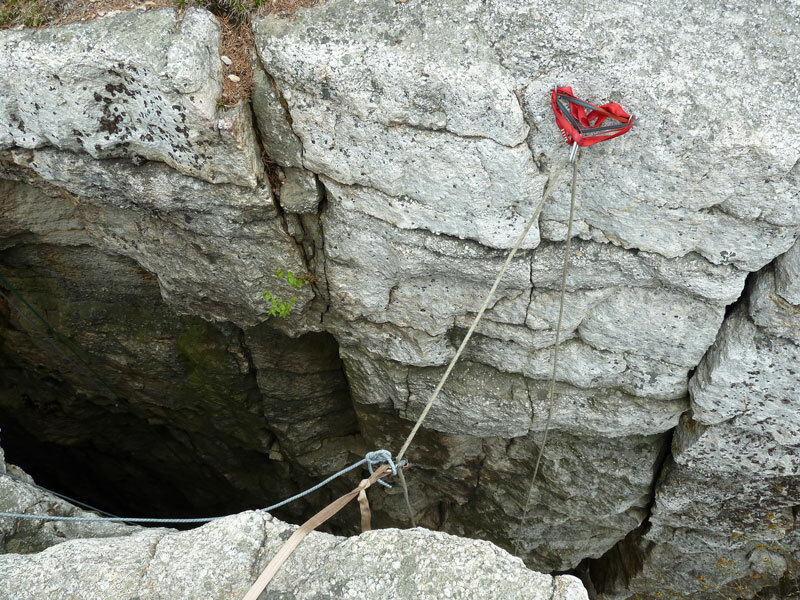 If you can be nearby to constantly evaluate the anchor for wear (like in a cliff-top management scenario where all belaying is done from near the anchors on top) then redundancy is not as important. Here though, the anchors are 80 feet away and out of sight. Redundancy is peace of mind in these situations. There's more bad than good here. There are two good bolts but that's the only thing going here, and the relatively sharp steel anchors could lead to this anchor's undoing in a hurry. We have the american death triangle again here and I've included the chart below so you can calculate the forces associated with this and the previous anchor if you like. 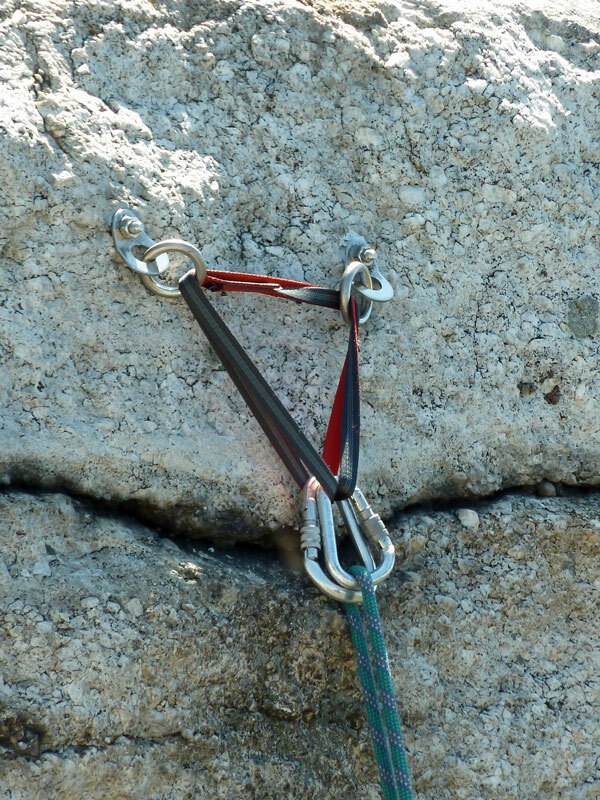 This anchor is equalized and redundant, but the angles are very high (120 degrees) and if the shorter sling fails the longer sling will get shockloaded. The problem with this anchor is the lack of carabiners on the bolts. Placing nylon on square-edged steel is like placing your anchor slings over a dull knife. The sling's not going to cut right away, but eventually it will get severed. 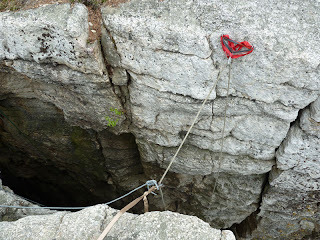 Had there been carabiners on the bolts the sling would maintain it's full strength (about 5000 lbs of force or 22kn). Without the carabiners the slings will fail at some unspecified lower load. With the large angles the forces on the sling are multiplied. Each time a climber leans back on the anchor and the belayer counterbalances their weight each bolt experiences approximately 800lbs of static load (assuming the climber and belayer are each 200lbs. and that's disregarding the much higher dynamic loads associated with falls, even toprope falls). This means that there is nearly 1600lbs of force between the bolts, being placed on the sling. Any load strong enough to cut the first sling will almost definitely damage the second, looser sling too. The carabiners on the rope are also being triaxially loaded - they are being pulled out of the axis of highest strength by the 120 degree angled sling. This will probably cause the carabiners to fail at a lower load as well. Here is the same group's redirect so they can climb on the other side of the block. This is also pretty wacky. The angle between anchors here is 180 degrees, and the webbing attached to the small pitch pine rubs over a pretty rough edge. If this piece fails when the climber falls they're going to drop 4-5 feet (hopefully they're not too close to the ground). 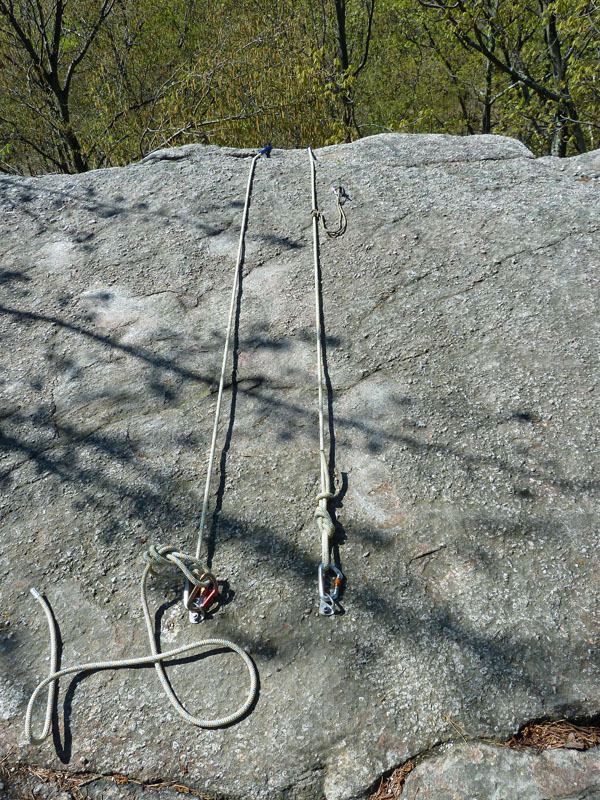 This configuration is also putting severe kinks in the rope, which can be seen between both top anchors. 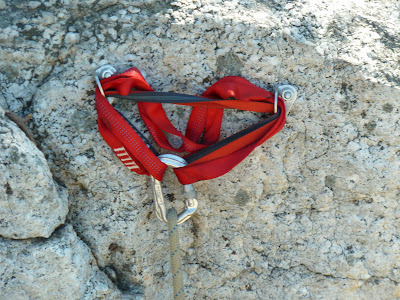 This is a good way to cause premature sheath slippage on your climbing rope. It's important to remember that all of the gear we use is exceptionally strong when used correctly. As a guide we're constantly hearing the phrase "the right application at the right time" and this phrase is very true. Our gear is only very strong when we are armed with the knowledge of how to use it properly. Rock Climbing Anchors: A Comprehensive Guide, Craig Luebben - This is one of the best books in print on the topic of climbing anchors. It, and the other Mountaineers Outdoor Expert Series are worth every penny.